Properties in Agios Georgios Church average 4.7 out of 5 stars. Modern 2 bedroomed Poolside Townhouse at Desire Gardens Peyia. Property 5: Modern 2 bedroomed Poolside Townhouse at Desire Gardens Peyia. 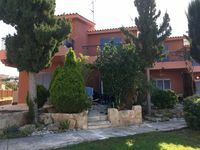 Lovely family friendly house with just a short walk to the Paphos attractions. Property 13: Lovely family friendly house with just a short walk to the Paphos attractions. Stunning 2 bedroom house in popular Tomb of the Kings area with shared pool. Property 19: Stunning 2 bedroom house in popular Tomb of the Kings area with shared pool. Well appointed 2 bedroom town house close to all amenities with internet. Property 27: Well appointed 2 bedroom town house close to all amenities with internet. 3 Bedroom Townhouse Peyia "Sea Views"
Property 37: 3 Bedroom Townhouse Peyia "Sea Views"
Spacious 2 Bed House with amazing sea views, new aircon & wifi - Great location! Property 46: Spacious 2 Bed House with amazing sea views, new aircon & wifi - Great location! Lovely complex and comfortable, thoughtfully equipped home. My hosts could not have done more to ensure I had a good stay. January is a very quiet time in Cyprus and many of the restaurants and hotels are closed until March. The good part of that is attractions and historical sites are not crowded and beaches are virtually deserted. It is cool at night, but the days have been sunny and warm enough to enjoy exploring and even sitting by the pool. There is a lovely beach walk into the old town, which takes about 45 mins and a regular bus service to the main road just below the complex. The local pub, a favourite with British ex-pats, is a friendly, warm spot with good, fresh food, weekly trivia and great staff. The appartment is well equipped, in a very nice garden. 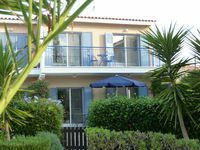 Clean and comfortable for 4 persons, 15&rsquo; walk to beach and restaurants. Paphos has lovely sandy beaches, Coral Bay is the most popular one 15 min. drive.